www.searchingforreason.net : Your Philosophy Course...Your Way. 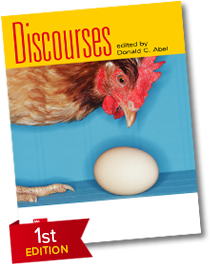 Create your own philosophy textbook with Discourses, a philosophy collection available through Create®, McGraw-Hill Education's online custom publishing system. Discourses is our best-selling collection of more than 470 philosophy readings, both classical and contemporary, on fundamental topics covered in philosophy courses. The readings have introductions, explanatory notes, and optional study questions. for specific courses), which you can modify. with no obligation to adopt. Download a PDF of the complete list of readings arranged by Topic or by Historical Period. Explore the entire Discourses Collection today! from the Ethical Theories section in the Discourses Collection. Customer Service to order a complimentary copy. Service at 800-962-9342 or mhhe.create@mheducation.com.